My name is Jaclyn and I consider myself to be a growing expert in food and nutrition. What I really mean to say is that, although I have a lot of nutrition knowledge, nutrition is an endlessly growing field and there is so much to learn. I am continually researching and working to sort through the maze, and want to help guide others through it as well. I recently completed my Dietetic Internship and will be a Registered Dietitian in a couple months. The road to becoming a Registered Dietitian in Canada (and especially Manitoba) is fairly grueling, with four full-time years of study and an unpaid, ten-month internship to complete. Although it’s long, you learn a ton in the internship program. I’ve been lucky enough to use Josh as my guinea pig for the last few years and he thinks I should share some of these cool recipes and tricks here on The Newsprint. My personal view about nutrition is simple: We need to learn to have a beautiful relationship with food where we don’t have to fear it or let it stress us out. Life is way too short for dieting and constantly worrying about every piece of food we eat. I think we all need to take food a little less seriously. This is my first piece for The Newsprint. If you have any thoughts, just send me an email! We’d love to hear what you think! Have you heard of white sauce before? Josh and I come from a Mennonite area1 where many old recipes and traditions have stayed around for generations. One of those traditions is white sauce. White sauce is made several different ways. When I was growing up, my mom made it as a warm, thick, pudding-like sauce. Where does one use this magical white sauce? Well, waffles! We serve this magical sauce with our waffles and it replaces the need for syrup or any other toppings. You can still have some fruit with it as well because, after all, you should probably balance this meal out a little bit. I came up with this recipe by blending a few favourite recipes together. I chose to add whole grain flour because it boosts the nutrition up a notch. Whole grain flour increases the fibre content and gives us more nutritional benefits. When using whole grain flour I like to blend half whole grain and half all-purpose. When you use only whole grain flour, you often get a denser final product. Use buttermilk to give a nice soft texture. Beat your egg whites until a stiff peak forms. It adds lots of air and fluffy clouds to your batter. This recipe makes four large Belgian waffles. If you have a waffle iron that makes smaller waffles, you’ll likely get a few more out of the recipe. The batter and white sauce also stay good in the fridge for about four days. 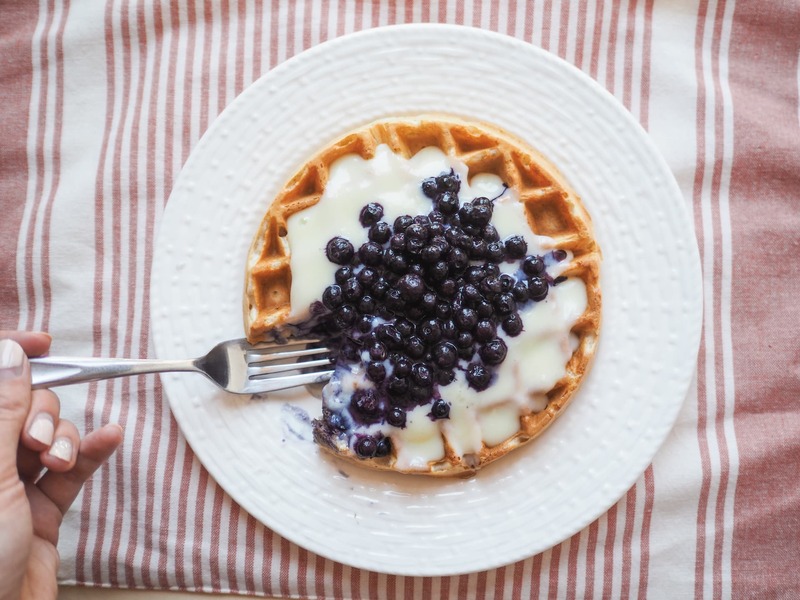 Have leftover waffles after your meal? I like to freeze them and Josh can put the waffle quarters into the toaster for breakfast during the week. This is a much healthier alternative to an eggo. Plus, these will actually fill you up! In a large bowl, sift together both flours, baking powder, baking soda, salt, and ground cinnamon. Set aside. 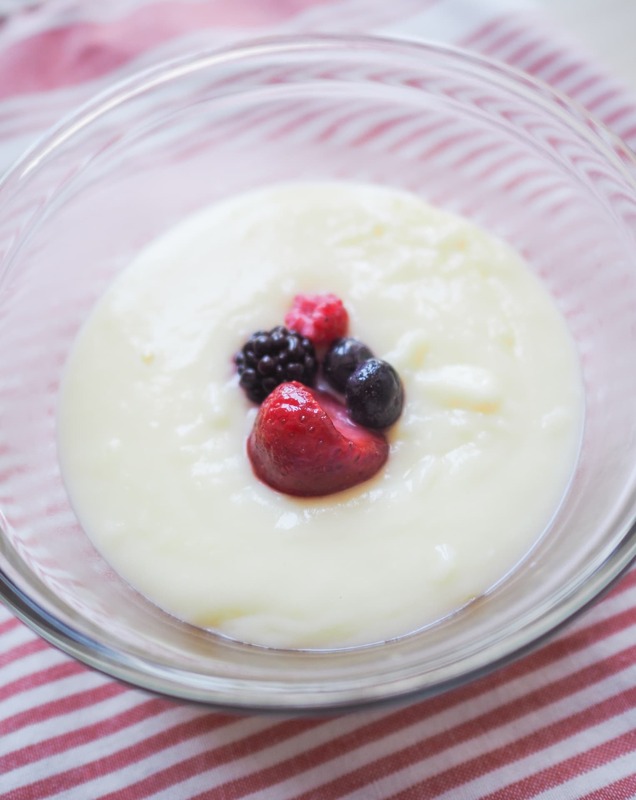 In a medium bowl, beat the egg whites with an electric mixer or KitchenAid mixer on high speed until stiff peaks form. In a separate bowl, whisk the egg yolks well and add buttermilk. Whisk together well. Stir the egg yolk/buttermilk mixture into dry ingredients. Add melted butter and mix well. Fold in the egg whites. Preheat your waffle iron. While doing this, you can make the white sauce. In a small sauce pan, gently boil 1 cup of milk over medium heat, stirring often. While you are doing this, in a separate bowl, mix sugar, cornstarch, and eggs together well. Stir in the remaining 1 cup of milk. Stir this mixture into the hot milk just as it is starting to boil. Stir with a whisk until the sauce begins to thicken. Spread the batter onto the preheated waffle iron, making sure to leave enough room for the batter to spread. Serve the waffles topped with white sauce and your favourite fruit topping. 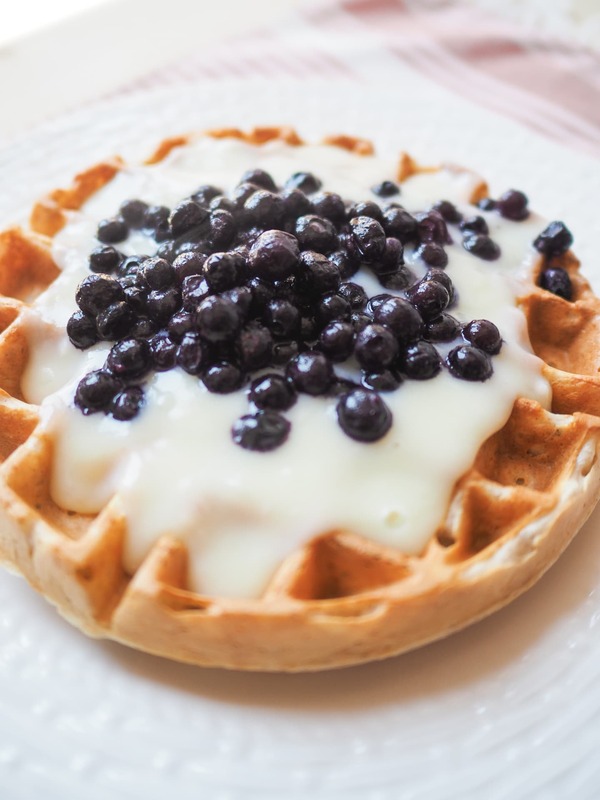 My healthy tip to make a lightened, yet healthy weekday breakfast, is to serve half a Belgian waffle with 1/4 cup white sauce, 1/2 cup thawed frozen berries, 2 hard boiled eggs, and a glass of milk. We can definitely still enjoy the foods we love while eating a balanced diet!